Toddlers, gardens and hose pipes! Read Steve’s top tips on how to get your garden toddler and parent friendly. Before I kick things off, I have to make a confession; I am not much of a gardener. I’m about as far as can be from my fellow Ketchup blogger Alys Fowler. I’m all about low maintenance and convenience rather than aesthetic beauty. But I do try, and over the last year or two, I’ve been, slowly, remodeling our back garden out of two necessities. Firstly, when we moved in, it was a shambles. The guy we bought the house from said his wife was a keen gardener but I’m guessing that was much more of a theoretical gardener rather than someone who actually took care of their lawn and flowerbeds. I won’t pretend to know what the plants were but there were lots and lots of them. And they were massive. They were so big that the actual lawn space that remained was probably little more than half the width of the garden. There was a rather unsightly metal shed and a home-made patio in the far left corner that was on a serious slant. At the time we knew we wanted to start a family so work had to be done. We ripped out aging trees and shrubs to the horror of my mum – “wait, that’s a hydrangeas chrysanthemum maximum!!! Surely you want to keep that,” was heard on more than one occasion. I think she even insisted on taking some plants home with her, so horrified was she at the thought of them reaching the end of their lives. But by the time we’d dug everything up, and then employed my dad’s wood chipper to dispose of the evidence, things looked a bit healthier. And that brings me on to the second necessity…Freddie. When we knew he was on the horizon, the creative work started. We knew, roughly, how we wanted it to look so step by step, we started to get things in order. 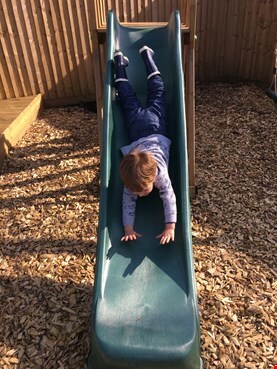 Flowerbeds were removed and grass was laid, a new fence went up and then, as Fred was approaching his first birthday, a decking area was painstakingly put together and finally, a playground was constructed with a swing and a slide. You see, even though I’ve never been a terribly keen gardener, I always appreciated the fact that a garden is whatever you make of it. But when you have a child, that all changes. standard request and then you’ve got to find a place to put the football goal (sorry Rachael, it’s happening and there’s very little you can do about it!). If you are more horticulturally-minded, forget it. You’ve got no chance. If Fred is anything like his daddy, any greenery we plant now has basically had it unless it can take a) being flooded as he plays some kind of soldier game, b) being trampled over as he recovers his football/tennis/cricket ball and c) being climbed. It’s a wonder my parents’ garden has anything left in it! So all that hopefully gives you a picture of our garden. Very few plants, plenty of grass, decking for mum and dad and a woodchipped play area for Fred. Low maintenance and perfect for our family needs. And that brings me nicely on to what I’ve just spent my weekend doing: getting the garden ready for spring and summer. The lawn had its first cut of the new year, the slide and swing were put back together, the rainwater was emptied from the rattan sofa cover and the flowerbeds were weeded. The edges almost got strimmed too but I was flummoxed by the most annoying thing in the entire world. If you’ve ever tried to strim you know what I’m talking about – the strimmer wire that keeps breaking off. It’s supposed to re-load itself. Don’t get me started. So, the Blands are good to go for spring and summer. We had a quick play on the slide yesterday and Fred’s little face was a picture of happiness as he plunged head first down the slide. When we first bought it, ahead of his first birthday, he was still a little young to really know what he was doing. But this summer he’s going to absolutely love it. We even managed to get him to help out with a little gardening. If gardening involves spraying everything with the hose and then crying when you soak yourself, Fred is quite the expert! 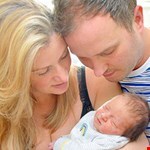 Rachael and Steve Bland are new parents juggling their journey into parenthood alongside unusual working hours. Rachael works as a BBC newsreader and Steve works as a producer on BBC Radio 5 Live. Follow their story as they embark on the most important chapter of their lives.